We are the Leading, Manufacture, Distributor, Supplier and Dealer of GI Cable Tray in Chennai, Tamil Nadu, India. 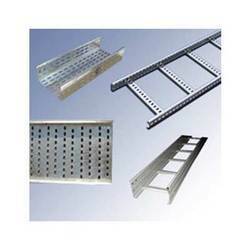 Our clients can avail from us hot dip galvanized cable tray . Widely used in electric and automotive industry. These GI Cable Tray have high mechanical resistance. Our range includes cable tray of all sizes, Trenches, Ducts in standards and customized technical specifications.